I’m not overly excited about the 2012 presidential race, especially since the major choices at this point are three candidates who don’t seem to have much commitment to economic freedom and individual liberty. 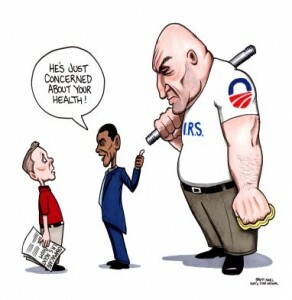 So when someone sent me this cartoon, I immediately decided it had to be my next blog post. Too bad we can’t turn the clock back 11 years. I’m not joking when I say I would gladly go back to Bill Clinton. No, he wasn’t a libertarian, but economic freedom increased during his tenure. And I care about results. Clinton’s track record on spending was especially good. Indeed, I even admitted on TV that I would accept Clinton-era tax rates if we could unravel all the new spending and intervention of the Bush-Obama years. But what I’d really like is a candidate who could sincerely give these remarks. Or, perhaps even better, make this statement. Back in 2010, I crunched the numbers from the Congressional Budget Office and reported that the budget could be balanced in just 10 years if politicians exercised a modicum of fiscal discipline and limited annual spending increases to about 2 percent yearly. And when CBO issued their update last summer, I did the same thing and once again confirmed that deficits would disappear in a decade if politicians didn’t let the overall budget rise by faster than 2 percent each year. Yes, you guessed it. 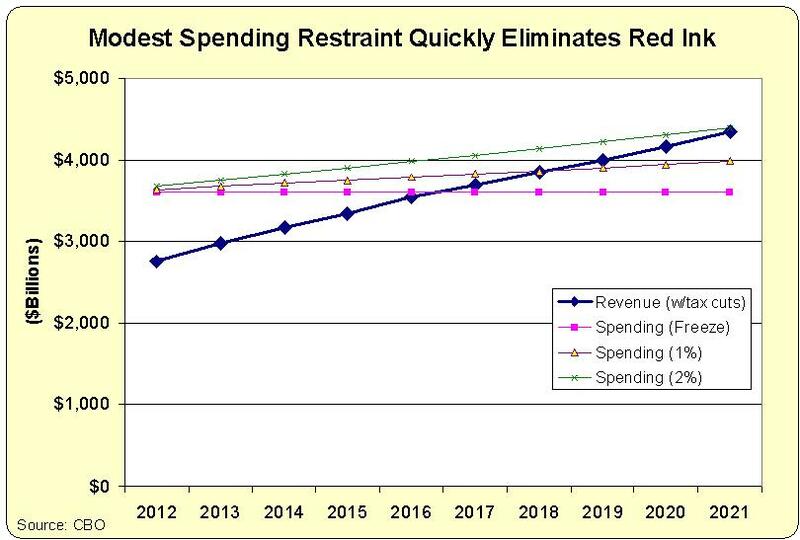 As the chart illustrates, balancing the budget doesn’t require any tax increases. Not does it require big spending cuts (though that would be a very good idea). Even if we assume that the 2001 and 2003 tax cuts are made permanent, all that is needed is for politicians to put government on a modest diet so that overall spending grows by about 2 percent each year. In other words, make sure the budget doesn’t grow faster than inflation. This creates a “baseline” and if they enact a budget that increases spending be less than the baseline, that increase magically becomes a cut. This is what allowed some politicians to say that last year’s Ryan budget cut spending by trillions of dollars even though spending actually would have increased by an average of 2.8 percent each year. Other than updating the numbers, the video is just as accurate today as it was back in 2010. And the concluding message – that there is no good argument for tax increases – also is equally relevant today. Back during the 1990s, President Clinton cleverly began to refer to his spending initiatives as “investments.” He obviously hoped that voters could somehow be tricked into supporting bigger government by playing a bait-and-switch game with words. Since the burden of federal spending fell significantly during the Clinton years, I’m not sure he was successful in his efforts. But he did win reelection in 1996, and that may be why President Obama has adopted the same tactic, using some derivation of “invest” about ten times in his big speech last week. If that sounds like overkill, the good news is that he didn’t use the term as much as he did in 2011. 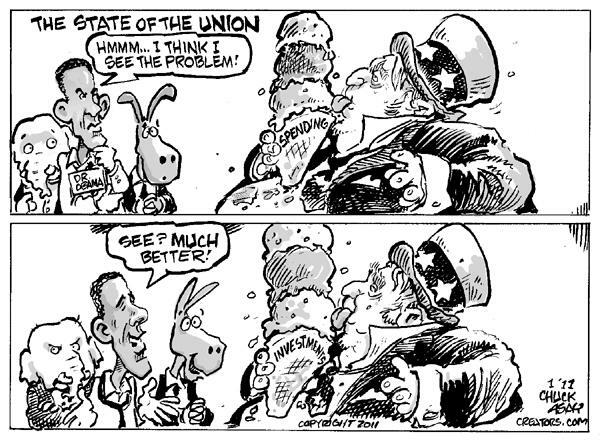 He was so repetitive that year that Chuck Asay produced this cartoon. Needless to say, it is equally funny when applied to this year’s speech. I’ve stated before that Chuck Asay is a great cartoonist. If you want to see more of his work, click here, here and here. Is an Ex-Congressman Lobbyist Capable of Shame? I’ve written before about the sleazy and corrupting impact of earmarks. And I’ve debunked the lobbyist arguments in favor of earmarks. Heck, I’ve even done NPR interviews about this unseemly Washington practice. So I like to think I’m reasonably knowledgeable about the system. But even I’m shocked to learn how a former Massachusetts Congressman has taken graft to the next level. And I’m slightly happy that he’s been caught with his hand in the cookie jar and feels compelled to give up his share of the loot. A former congressman who became a lobbyist has abandoned his plans to collect $90,000 from working on an energy project that he helped finance through Congress. …An apologetic Mr. Delahunt told town officials he wanted to eliminate the “black mark” created by questions of a possible financial conflict, Patrick Cannon, chairman of the Hull Light Board, said on Saturday. …Mr. Delahunt, a Democrat who retired from Congress last year, had faced criticism for the last week from legal and ethics specialists over the unusual lobbying arrangement he had struck with the town, which is seeking federal help to build an offshore wind energy plant at a cost of more than $60 million. While in Congress, Mr. Delahunt earmarked $1.7 million for the same project, and he was to be paid 80 percent of his monthly consulting fees out of that same pot of money. …Mr. Delahunt and executives at his firm did not respond to e-mails Saturday seeking further comment on the decision. Wow. For all intents and purposes, Congressman Delahunt directly pilfered the Treasury for personal gain. This is amazing. But what’s remarkable isn’t that he stole money. After all, the federal budget is largely a big scam enabling various groups of people to obtain unearned loot. The noteworthy thing about this story is that he didn’t launder the money. In most cases, politicians do earmarks as part of a corrupt quid pro quo. They direct money to a certain group of beneficiaries and, in exchange, get campaign contributions from both the lobbyists who facilitated the deal and the interest groups that receive the taxpayer funds. But Delahunt cut out one of the middlemen. He created an earmark, and then became one of the lobbyists pocketing the cash. So it is poetic justice that this unsavory deal has become public knowledge and the former Congressman has been shamed into giving up his fees. But don’t be deluded into thinking this is a victory. The earmark is still there. Money is still being wasted. Delahunt is still a lobbyist. Government is still too big. And corruption is still rampant. And if you think the former Congressman is genuinely apologetic….well, please get in touch with me. I’m selling a bridge in Brooklyn and need a gullible buyer – i.e., the kind of person who doesn’t think there’s anything wrong with this unseemly example of sleaze. Even when the results coincide with my views, I have a jaundiced view of polling data. In large part, this is because the answers often depend on how a question is framed. That being said, I periodically link to polling data about economic policy if I think we can glean some insight from the data. I assume, for instance, that trends can be accurately detected if the same question is asked year after year, regardless of whether the question is fair or slanted. This is why I posted this poll showing that Americans are increasingly hostile to the federal government. Similarly, I showed this data on how a growing number of Americans see the federal government as a threat to freedom and liberty. I also like multi-country polls. Whether the questions are straightforward or tilted, you can at least learn something about differences in national attitudes. One of my favorite polls, for instance, compared the degree to which Americans and Europeans think it’s okay to mooch off government. I’m not sure, though, how to react to this latest survey data. Published in the New York Times, it shows widespread global support for more regulation. Here are the results (click the image to enlarge). These results obviously are not good news for supporters of deregulation – especially since the burden of red tape already is so onerous. The only bit of good news, at least for American chauvinists, is that people in the United States are more likely than others to think there is “too much” regulation. But if you look at the data from a different perspective, people in Singapore and Sweden are least likely to say there’s “not enough” regulation. The most puzzling bit of data is that people in Hong Kong appear to be the most sympathetic to regulation. Considering that Hong Kong is the most economically free jurisdiction in the world, this doesn’t make much sense. People keep emailing and complaining that I must be an Obama supporter since I periodically post critical information about Romney and Gingrich. In response, I say that it’s my role to simply tell the truth and dispassionately analyze public policy. But being disappointed in the leading Republicans doesn’t mean I’m deluded about Obama and his agenda. 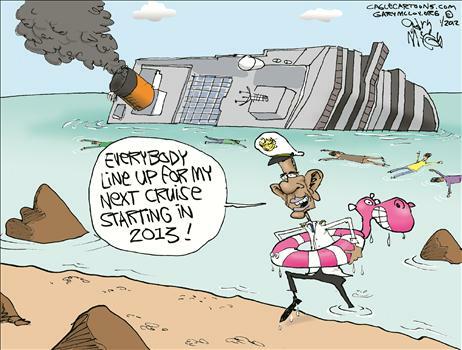 This cartoon nicely captures my view of the President’s track record. And if you want something more substantive, this data from the Minneapolis Federal Reserve shows how Obamanomics is grossly inferior to Reaganomics.